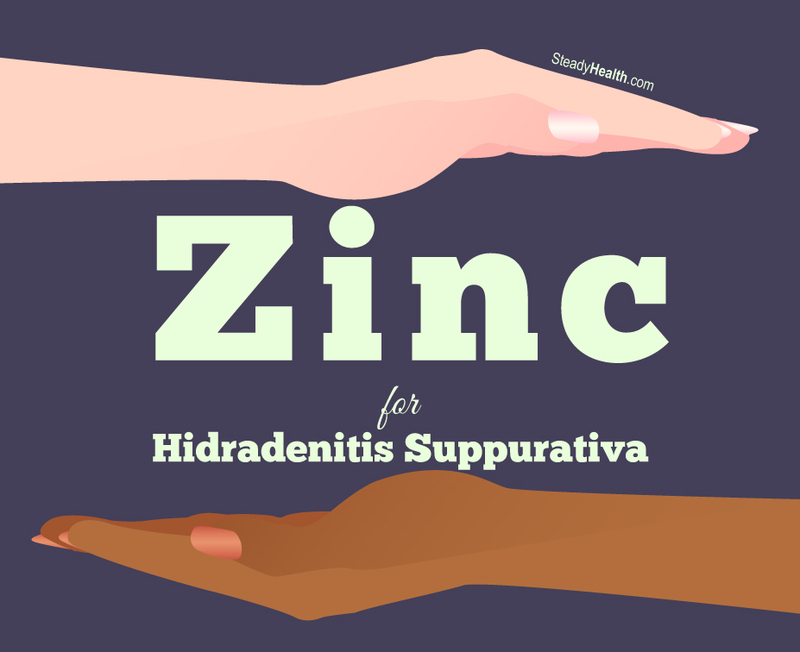 Zinc For Hidradenitis Suppurativa: Can This Simple Cure Treat Your Hidradenitis Suppurativa? Dermatological conditions are commonly treated with zinc supplementation due to its versatile properties in numerous anti-oxidant and anti-inflammatory reactions. Will it help you if you are suffering from a more severe condition like HS though? Patients who suffer from Hidradenitis Suppurativa must deal with a combination of painful pustules that can ulcerate and the frustration that whatever they do to try to help their condition, the relief will only be temporary in most cases. Even the most definitive hidradenitis suppurativa treatment options like hidradenitis suppurativa treatment with lasers or surgery will only provide temporary relief, and most of these skin lesions will return in just a few months. Patients can try to take treatment into their own hands and try to "nip the pain in the bud" by trying to utilize a cascade of natural treatments for hidradenitis suppurativa that can dampen the frequency of flare-ups of these pain episodes. One such therapy that could be beneficial would be using zinc for these skin ulcers. Here, we will analyze if zinc for hidradenitis suppurativa is a potential option for you to consider and if it is capable of providing relief. What Does Zinc Have to do with Skin Problems? Using zinc for skin conditions is something that you probably have been doing yourself without even knowing it. Most modern versions of soaps and shampoos have small amounts of zinc added to the final fluid as a potential therapy for dandruff and other skin conditions that are quite prevalent in the general population . Zinc is considered to be an essential element in our bodies because it is needed in hundreds of biochemical reactions and some of the most obvious first signs of a zinc deficiency would be skin rashes that appear . Chronic conditions like gastrointestinal diseases or alcohol dependence can predispose patients to suffer from zinc deficiencies even more. Populations that are at risk for zinc deficiencies coincidentally are pediatric patients, the same age group that HS is likely to be first found as children approach puberty. In population studies, it was determined that zinc deficiencies could be as high as 20 percent in developing countries, but rates in Western cultures can also ellipse 10 percent . In balanced diets, it will be quite easy to achieve the daily recommended values of zinc you will require daily, but if you are a picky eater (like many children), there is a good chance that appeasing a child's palate may be robbing him of essential zinc inadvertently. Some foods with the highest levels of zinc would be oysters, lean beef, ground beef, turkey and peanuts . If you can already envision a struggle trying to get your child to eat any of these foods, zinc supplementation with tablets may be a more fruitful venture for you. Will It Help My Hidradenitis Suppurativa? This is a promising result but there are a number of limitations that make it hard to believe that zinc will be as effective as advertised in this study. Firstly, this was a pilot study done on a small number of patients so it is hard to conclude if zinc will be as effective when used on a larger population. Secondly, this study was also conducted on patients who had underlying Hurler Syndrome, a common co-morbidity of HS. Patients without the this underlying metabolic disease were not studied so it is hard to stay that zinc would help or be ineffective in a more typical HS patient. Considering the near-universal use of zinc products in other dermatological conditions and the few side effects that are possible, it would not be a bad idea to ask your dermatologist if zinc is an appropriate natural treatment for hidradenitis suppurativa that you could try out. The worst that can happen is that is will lead to a relapse like most other hidradenitis suppurativa treatments so there is no harm in trying. Zicam cold remedy: How does zinc fight a common cold? What types of food poisoning are there? What is the worst scenario when it comes to food poisoning? Zinc - It's Not Just for Treating Colds Anymore!